I remember hearing this story in a history lesson sometime in my youth and wondering, even at my tender age, “What were they thinking? !” In all honesty, though, I’ve remembered this story primarily at moments in my adult life when I find myself in frightening situations that I am in only through my own volition. An example may be helpful to illustrate. One mild midnight, everyone trooped out of a friend’s New Year’s Eve party to stand on the deck of her neighbor’s pool while he set off a celebratory fireworks display. The pyrotechnician/arsonist for the evening was highly intoxicated, which should have been a red flag. In fact, my friend’s husband (a former firefighter) refused to join the group and this, too, was a warning that went largely unheeded. When the first volley of rockets was lit, they all came zooming straight at the spectators standing where we had been told we would be “safe.” I imagined the headline: “12 Revelers Hospitalized: Too Idiotic to Avoid Drunken Fireworks Display”. I could give many more examples. But the point is that we all sometimes walk blithely into situations that, given a little time and forethought, we might otherwise avoid. So while I occasionally think of these events and rue my naiveté, I don’t beat myself up over them. Instead, I try to learn from them for the next time. Just as I’m fairly certain no one who rushed out with a picnic basket to watch the first Battle of Bull Run made that same mistake at the second Battle of Bull run, I am pretty sure I will listen to my gut telling me to distrust drunk men with matches and incendiary devices. Usually, I’ve thought of the Bull Run revelers from the perspective of advanced reasoning skills – and whether or not these unknowns from the past employed them. I can totally see how it happened, though: everyone had been talking excitedly about the impending war for weeks; the rumor was that one battle would determine the war – and as luck would have it, that battle was going to take place in their backyard! They grabbed their friends, some food and beverages, and headed out to see history in the making. How cool is that? This time last year, I was pondering a significant outing in my own life. I worked with a coach, I talked about my options with friends and family, and I carefully combed through my own inner desires. I worked with a financial consultant and parsed my choices. All of the work, the research, the endless discussions came down to this – I either packed my basket and went off to the battle or I stayed where I was. The battle was where great things might happen, where history might be made. Staying put was where, in the immortal words of Barry Manilow, it was “all very nice, but not very good.” Despite the forethought I gave this life change, I had no way to predict the course of the future. For this very reason, my empathy for the picnickers at Bull Run has increased – while they might, admittedly, have seen the downside to their plan, even they could not have known the future ahead of time. In fact, upon reflection, it turns out that spectating at the Battle of Bull Run and taking a leap of faith into our own possible futures have a lot in common. No matter what we’re packing for our journeys, we can’t predict what we will actually need. Did the Bull Run picnickers pack weaponry and ammunition with their sandwiches and lemonade? Lord knows, they likely needed things they hadn’t brought with them. We’ve all been there. You open your basket, or suitcase, or toolbox, and what you need is conspicuously absent. There is no point in crying about it, you have to just let it go and move one with what you DO have. Keep the faith, but also take the action. If you ever find yourself in the midst of a pitched battle, pray for guidance and assistance. Then, ditch the picnic basket and run! Cowering is a human reaction. Allow your humanity its experience of panic. But don’t stand still and wallow. I expected change in my own life to be hard. I am, by nature, risk-averse and here I was, taking a huge risk (quitting my job, relocating, starting over). What I didn’t expect was for it to be this hard – reality-hard, as opposed to thinking-ahead-hard. This horrible winter encouraged my natural reaction to hunker down and wait it out. The more I ducked-and-covered, the higher my anxiety climbed. What I have discovered is that any action with forward momentum, no matter how small, results in a lessening of the fear. We’re all on the road to hell… So you didn’t intend to get caught in the middle of a pitched battle between two armies? Too bad, because that’s where you are now. What we intend and what actually happens don’t always match up. When this occurs, life doesn’t stop and wait for us to catch up with it or to get with the program – it inexorably marches forward. For example, I’ve had to intentionally tell myself that I can’t keep putting things off while I am “in transition”. I may not feel or even be settled, but my life IS this moment, not what happens down the line. If you’re not where you intend(ed) to be, work to change that. Just don’t forget that tomorrow is never guaranteed. Today is your real life, inhabit it! Adrenaline might help you run faster, but it wreaks havoc on your health over the long haul. If you are in physical danger, by all means keep running! Your flight response is intended to keep you alive, to help you survive. But when the danger is fear of the future, it is probably time to take steps to let the adrenaline dissipate. There is a pandemic of anxiety in our society these days. One way to counter it is to make yourself stop running. Slow down, breathe, pray or meditate. Recently, I felt my own panic and anxiety rising daily to the point where it seemed to sit on my solar plexus like a huge granite boulder – immovable. One night it became unbearable; I laid in bed struggling to breathe around its weight. That’s when I discovered a secret: I could just give it away. I said out loud, “God, I’m giving this to you. Its yours. Both this boulder of anxiety and the future I’ve been so panicked about. I’m trusting that you’ve got this.” I felt immediate relief in that moment. I strongly recommend letting God/the Universe/your Higher Power take this burden. When the anxiety threatens, remind yourself that the future isn’t your problem or concern. Put the faith back in the phrase “leap of faith”. We will all find ourselves at points in our lives asking, “What did I just do?” or “How stupid can I get?” These questions may occur at the surface (such as in the case of the New Year’s eve fireworks) or at the deep, interior level of growth and change. Like me, you may find yourself wondering, while feeling vulnerable and exposed, “Did I just show up for a battle with nothing but a picnic basket?” Our best response is to be open to the possibilities for exponential growth this may provide. Will it be frightening, difficult, and/or life altering? You bet. Will it also be worth the pain and self-doubt? Martha Beck, life coach and self-help guru says, “You’ll find that the more annoying or even devastating an adventure is to live, the better wayfinding tale it makes.” Let’s take that as a “Yes”. I posted this once before as a Flashback Friday: my sister Chris, brother Jeff and me (in the middle) in a staged photo from our childhood. Coincidentally, Jeff now owns a coffee shop! Let’s get this out on the table right away: I don’t really care what anyone else thinks about this. I definitely don’t care what conflicting medical studies show. And I don’t really even care if what I am about to tell you is factually true. That’s how one-sided I am when it comes to my life with coffee. When I was a kid, my grandpa Postel lived in an apartment in the basement of our house. Occasionally, I got to stay overnight in the apartment with him. (There were six of us kids, so by the time he cycled through the bunch, it was a rare and special event). After spending the night, we’d get up early and go to 6:00 a.m. mass at the Cathedral, followed by breakfast at Rings Restaurant on Dodge Street. On these special mornings, I was given the choice: a cup of tea or one of coffee, loaded with sugar and creamer. I always chose tea. To this day, I regret my childish mistake. My parents lived on coffee (reference the 6 children mentioned above). My mother didn’t leave her bedroom in the mornings until she’d had her first two cups, delivered by my father or one of us kids if a proxy was needed. Depending on the day, there might be a pot at lunch, but there was WITHOUT FAIL coffee at supper. I learned how to use an electric percolator at an early age. By the time I was in high school, I was regularly helping myself to my parents’ stash. Of course, I poured in the sugar and milk, but there was no mistaking that dark, earthy coffee flavor. 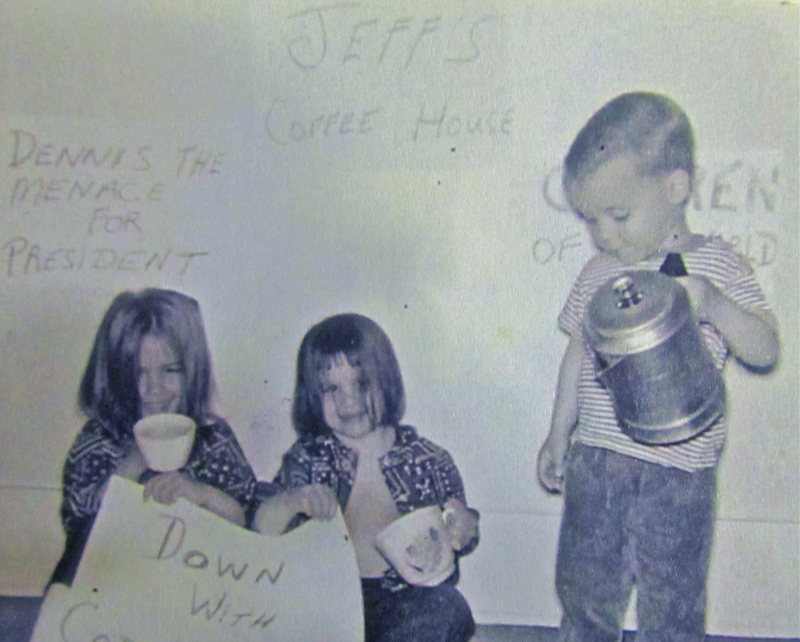 Then, in 1976 a coffee shortage happened, and prices skyrocketed. In an effort to curb their children’s burgeoning taste for the liquid gold, my parents instituted a “drink it black or not at all” rule in the house. They said that if we didn’t like the way it tasted on its own, we didn’t like it enough to justify the expense of drinking it. Unfortunately, their Machiavellian plot backfired, because 1976 marks the year I fell truly, madly, deeply in love with the bean. Throughout my college years, I was an aficionado of the greasy spoon coffee: Saturday mornings at a breakfast cafe where a waitress named Patty kept it hot and filled to the brim; late nights at Perkins, where my friend Marty would wave the empty pot over his head to signal our server that we’d reached the bottom of yet another “bottomless cup”. By the mid-80s, I was in grad school and the modern coffee trend finally reached the midwest. 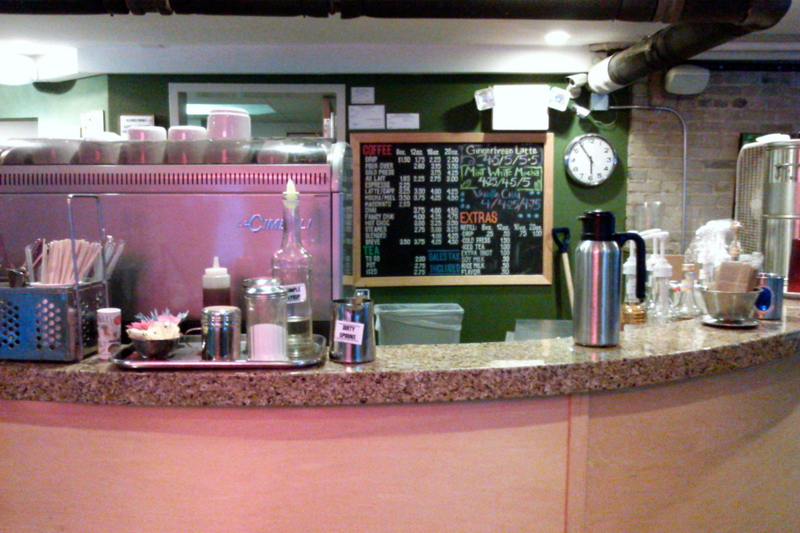 Coffee shops with flavored coffees, brew bars, and coffee drinks proliferated. (Unbelievably, it took almost another twenty years for Big Coffee to claim any real estate in Iowa.) I officially became a coffee snob. Regardless of the ambience or delivery method, I remained true to my coffee purist roots. I drank it black and strong, first thing in the morning and all day long. Occasionally, I ordered a cappuccino to experience the sublime flavor of coffee sipped through expertly foamed milk. (Eventually, a trip to Ireland changed my coffee habit irrevocably – the first time I drank coffee with real Irish cream. 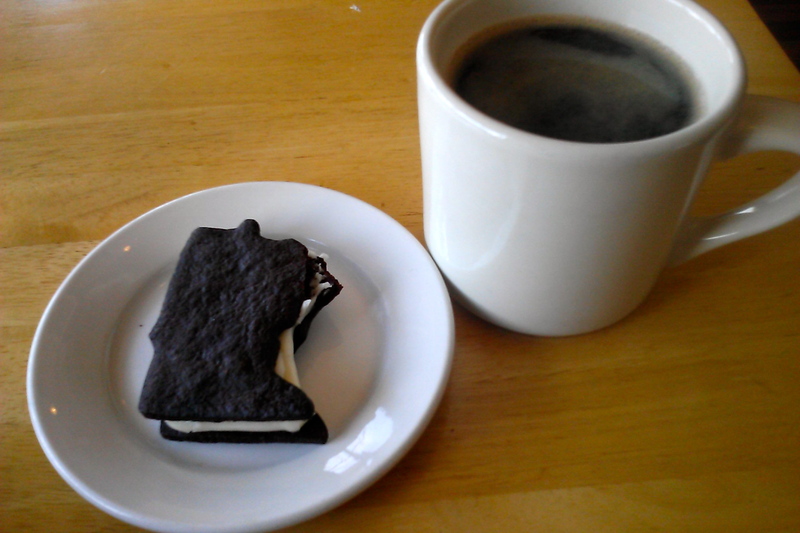 Now my Americano is almost always softened with half-and-half.) I often drank copious cupfuls of the stuff at night, then went to bed and fell peacefully asleep as soon as my head hit the pillow. I realize that everything I’ve shared thus far serves as an argument for addiction. I can’t deny that. About ten years ago, I was suffering from horrible heartburn and acid reflux. I gave up soda and coffee, cold-turkeyed them both. I felt horrible for several days as I suffered with the telltale splitting headache of caffeine withdrawal. And here’s where the love affair side of things kicks in. After successfully removing coffee from my life for almost a year, I felt physically fine but found myself still longing for a cup, for the taste of it in my mouth: I missed my cup of joe. More important, I missed the ME who indulged in those cups. So I started up again – and, like a miracle, discovered that coffee was not the cause of my previous discomfort. I still only rarely indulge in sodas, but I quickly returned to drinking coffee daily. Why did I miss coffee so much? I missed the ritual of having a “first thing in the day”. I missed holding the warm cup in my hand. I missed the warmth of familiarity coffee offers in cold new surroundings, and I definitely missed the purposefulness of “going for coffee” as opposed to wandering about town aimlessly. Most important, it wasn’t until I gave up coffee that I discovered just how much a part of my social engagement with family and friends it was. When I visit my parents, morning coffee is my favorite part of the day – we read the paper or watch the morning news and talk in an unguarded way that is never really replicated at other times of the day. With my siblings (one brother actually owns a coffee shop) and friends, long, rambling, silly or serious discussions are had while hanging out over coffee. Or, like when I visit my brother Matt in Chicago, we get up and out to walk over to Cafe Mustache and engage with the neighborhood – something I’ve happily replicated in my new neighborhood by heading over to the Boiler Room. When I am alone, as I am so often since moving here, coffee shops are always welcoming, and good coffee fuels my ability to relax then focus on projects. I’d like to mention that I have dear friends and family members who DON’T drink the stuff. Even some who cannot understand in any way its appeal. We have awesome times together, too, though they’ve accepted that I might bring coffee with me to their homes (and drink it while they share a bottle of wine). My friend, Sue, even keeps an elegant electric percolator in the cupboard – and coffee in the freezer – just to make me feel at home when I visit. Can I live without coffee? I know the answer is yes. Would I want to? Not really. So, you may be wondering, why am I sharing this long reminiscence about the role of coffee in my life and personal history? Well, I wanted you to understand my relationship with coffee, my love of it, before I share part two next week – my adventures in working at a coffee shop. Stay tuned!